Just added: Browse title screens by decade! Note: Page load times may be long! New Additions page makes it easy to see what's new. A unique catalog of movies...specifically, screen captures of movie title screens! Jump right in...select the first letter to go to that letter's index page. 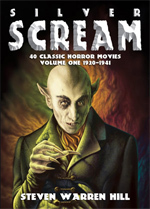 * For information on my books (about classic horror films) visit Silver Scream. What good is it? Whatever use you put it to. Browse and admire title and logo designs, check out movies that have completely different titles in different release prints (see Battle of Britain or The Premature Burial for good examples), check out the differences in multiple releases of the same title (see Aliens or Invasion of the Body Snatchers for a good example), check to see just how "wide" is the widescreen (width/height=aspect ratio... and does it match the sleeve description?)... use the logo when designing a web page for your favourite movie...include the title screens in your video database... the possibilities are... well, not endless, but many! Please note that the aspect ratio shown is merely calculated from the image size and, although very close to the actual ratio, may not be 100% accurate. A word about titles that are obviously widescreen captures, yet say "1.33:1": these are movies that are presented in full-frame (usually VHS sources) but feature their title screens (and credits) in widescreen. Also, in some instances, the title screen is transferred at a slightly different ratio than the rest of the film, usually to allow for overscan. When I crop these, I use a frame from the MOVIE as my guide, not a frame from the title sequence. Thus, you will occasionally see instances such as The Quiller Memorandum DVD, where the title screen has a black bar underneath. No, that wasn't a cropping mistake on my part, the title sequence is slightly wider than the rest of the movie. The ratio measurement remains accurate this way. Title screens with all-black backgrounds work similarly - I capture a bright frame from elsewhere, overlay it on the title screen, then crop it to properly match the frame edges. 1. "So, what are you, insane? Disturbed? Obsessive?" 2. "How can I contribute?" 3. "How can you NOT have (__________) in the gallery?" 4. "Why is there so much time between site updates?" 5. "Can you explain what the details mean on the index pages?"